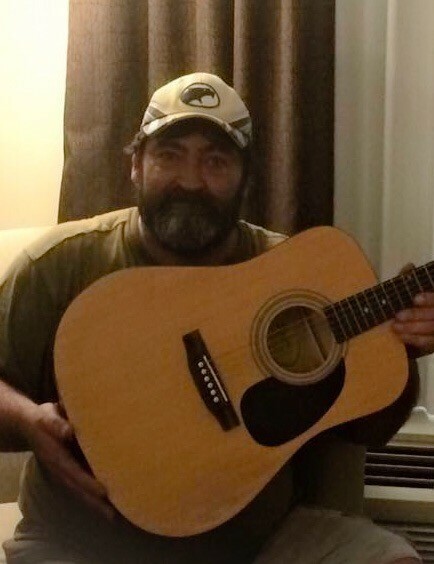 Dwayne Edward Lee, 49, of Dayton, OH, passed away Tuesday, April 9, 2019, at his residence. Dwayne wore so many hats and meant so much to so many. He was a husband, father, son, brother, uncle, son-in-law, brother-in-law, cousin, best friend, musician, cook, umpire, referee, ball player, animal lover, carpenter, tile worker, reader, mechanic, bull-crapper, dreamer, but most importantly, child of God. Obituary Disclosure: This unconventional obituary, written by his big sister, Sherry, and edited by his little, Karen, is greatly skewed and biased toward our perspective of him. We will attempt to be fair to everyone in his portrayal. We loved Dwayne as only sisters could love a brother. He had such a great sense of humor. It is a privilege to honor him, by writing this portrait in words. Our mother, Linda Shankland Lee Peckham, shared that June 17, 1969, she was in the grocery store with her sister-in-law, Joyce Lee Isaacs, and me, Dwayne’s big and only sister at the time, when her water broke. Anyone from the Kettering/Dayton, Ohio vicinity should be able to grasp two women in a panic at the Dorothy Lane Market, trying to rally a five-year-old completely fascinated by the puddle of water mom was standing in. After a full day in the hospital, he just refused to come out. Induced labor was required. We used to say that he came out kicking and screaming. Anytime he would get into trouble as a child, there was a conversation about his difficult birthing. He was a fun-loving, strong-willed little boy that had big brown eyes and a beautiful smile. He grew into a kind, tender-hearted, still strong-willed man that truly liked people. He would give a man the shirt off his back or his last dollar to a friend in need. Dwayne was such an incredible athlete and talented musician. Not only could he play his guitar, but he had an incredible ear to hear the music. He could feel it. The songs he wrote told stories that came out in the notes that were played full of emotion. They would leave one spellbound. I’m saddened that they were all in his head and not written down. We can all look forward to hearing him play in heaven. Dwayne is survived by his beautiful wife, PJ (Paula Jean) Lee and his beautiful daughter, Jensen Lee. He loved them both unconditionally. His parents, Linda Shankland Lee Peckham and Samuel David Lee (Lora Lee). He would be shaking his head, laughing, if he realized how much of our parents’ lives were spent in conversation about “that boy and what they were going to do with him”! He is also survived by his siblings, Sherry Lee Pentecost (Bracey), Karen Lee Shaddix, Alisha DeHart, and Michael David Lee. Brother-in-law, Chris Nace (Lisa) and sister-in-law, Jean Mills (Jim) Nieces – Ashley Elaine Claborn (Will), Breanna Shaddix, Emily Maggard and Serenity Jade Lewis and one great niece, Margaret “Maisie” Claborn. In his extended family by marriage, he also is survived by grandmother, Betty McKee and, and grandfather, Roy McKee. Dwayne was blessed to have a host of aunts, uncles, and cousins who loved him. There are too many too mention for fear of leaving someone out. Dwayne is also survived by one additional, precious soul that he held close in his heart and would want us to mention. A celebration of his life will take place at Boone-Nickell Funeral Home in Flemingsburg, KY, Saturday, April 13, 2019. Viewing will be held from 11:00 a.m. – 1:00 p.m. with the service at 1:00 p.m. Interment will take place immediately following at the Fleming County Cemetery. There will be food and fellowship after the burial service at the Wallingford Christian Church in Wallingford, Kentucky. Pallbearers will be Ashley Rigdon, Ricky Newsome, Larry Caudill, Tate Terrell, Willie Isaacs and Will Claborn. Honorary Pallbearers will be Michael David Lee, James Stacey, Bracey Pentecost, William “Billy” Kelly, Jim Kremer (deceased) Brian Rauscher, Johnny George, Chad Love – and so many other Brothers for Life. Dwayne leaves behind incredible memories for family and friends. He will be dearly missed. For friends and family living in Ohio, there will be a life celebration for Dwayne’s 50th birthday at East Kettering Recreation Center in June. Details will be posted on Dwayne’s Facebook page closer to time.